‘Tis the season to get offended. A Pennsylvania family has been ordered to take down a Christmas sign that reads ‘JESUS’ after a neighbor complained they were offended by the decoration. Mark and Lynn Wivell of Adams County, a Gettysburg subdivision, was told to take down their display that they put up last week by their homeowner’s association. ‘As part of our Christmas decoration, we would display the name Jesus to point out to everyone that we in this family believe that the reason for the season is to celebrate the birth of Jesus,’ said Mark told FOX43. The association told the family that the Christmas display specifically went against the rules. Residents are disallowed from displaying signs, and the HOA said the festive missive was not in fact a decoration. ‘After taking a look at it, it isn’t in accordance with normal Christmas decorations,’ Bud Vance, the HOA president told the Gettysburg Times. 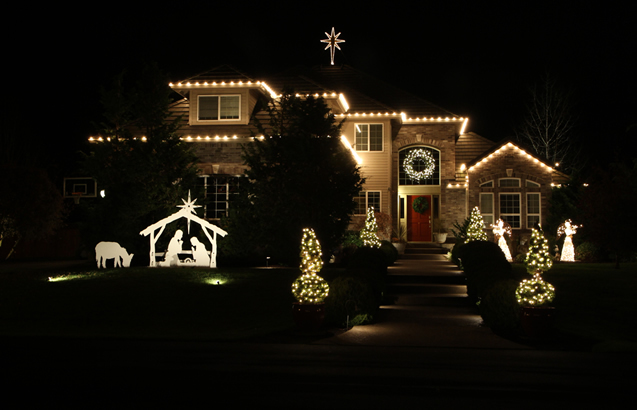 ‘We have ordinances with regard to Christmas decorations, and my Christmas decorations comply with the HOA ordinances on Christmas decorations,’ Wivell argued to Fox 43. The family said they are refusing to take down the sign until January 15 when everyone is required by the HOA to take down their displays. They also say people who take offense over things shouldn’t infringe on others, and they add they don’t know which neighbor was upset over the JESUS sign, or decoration. ‘People get offended by different things, but just because something offends you, doesn’t mean the whole world has to change to accommodate you, so I would say please be more tolerant,’ Mark said. Board members, however, felt like they were being vilified unfairly, and during the holidays to boot.